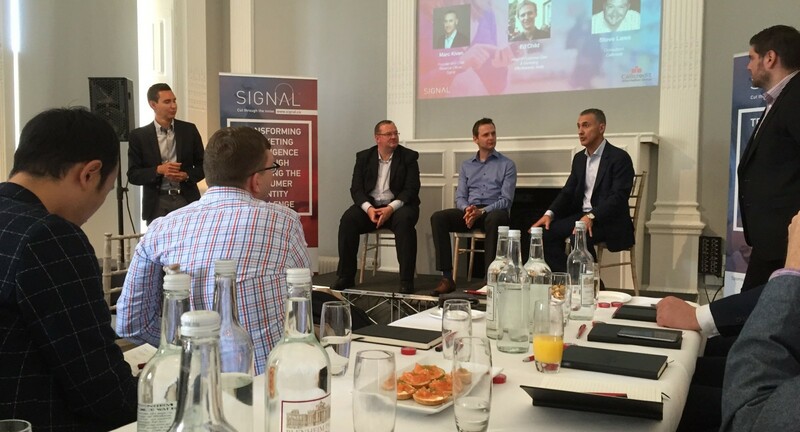 Last week, Signal’s EMEA team hosted an exciting event for our clients and friends in London, where the discussion centered on the importance of fusing data and identity through collaboration, and the ways in which Signal is driving innovation in this arena. The roundtable drew an audience of brand marketers and publishers to the lovely Institute of Contemporary Arts. Joining from Signal’s team were Marc Kiven, Founder and CRO; Neil Joyce, Managing Director, EMEA; and Blane Sims, SVP, Product. Steve Laws from Callcredit, Ed Child from Asda, and Marc Kiven from Signal discuss the data and identity challenges facing marketers. The audience and panelists achieved a consensus on a few points. First, it’s very difficult to connect all of an individual’s data into a single holistic profile. Second, brand marketers feel their companies aren’t currently doing customer identity well, but they agree that it is crucial to their business. There is both a Data + Identity challenge facing marketers today. The customer journey is difficult to understand due to fragmented siloed data – it’s easy to lose track of your customer signals. We need to think beyond the cookie, this is about people-based engagement. To manage all data types effectively, marketers must move beyond siloed user data to create known, unified profiles that power 1:1 customer relationships. The key to making this happen is identity. The ability to reliably identify customers and act upon their past and present behaviors can be transformational for businesses. To do so without giving up control to walled gardens will require brands to come together to find solutions through collaboration. Activating data is about activating people. Leveraging a data-driven process through collaboration using persistent, always-on, secure first-party customer behavior data at scale enables increased personalization driving value creation, ROI, and most importantly, a better customer experience. With Signal’s first-party identity network, brands have stronger, persistent “always on” enriched user profiles that allow you to segment and target customers with stronger accuracy and certainty at scale. Through collaboration, we have an incredible opportunity for marketers to identify, accurately target, and convert their customers in a way that provides a competitive advantage, drives equitable brand and customer relationships, and provides true solution ownership and security. Thanks to all who came to our event in London! It was a smashing time.